The Halo Wars 2 Xbox One patch has been deployed and its enhancements have been detailed. 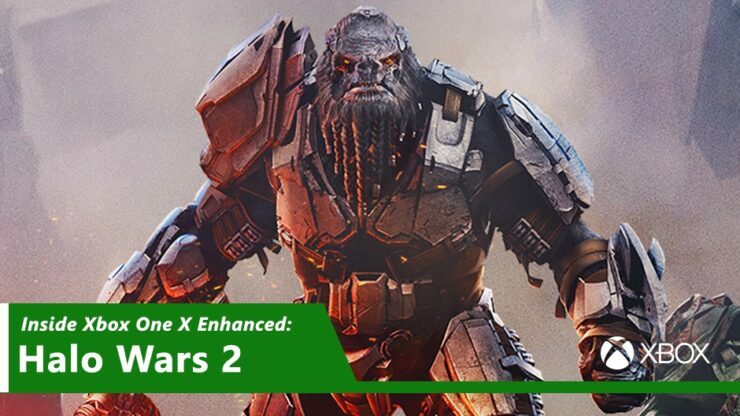 As covered earlier, Halo Wars 2 on the Xbox One X is said to be basically on par with maxed out PC settings in 4K Ultra. “We only have really limited comparison points thus far – essentially based around the tutorial and the first mission – but there are areas where Xbox One X looks better than the maxed-out PC experience, though whether this down to work-in-progress lighting bugs or by deliberate design remains to be seen”, Digital Foundry wrote back in September of this year. In an interview with Xbox Wire, 343i’s senior producer Greg Stone has now discussed the game’s enhancements on Microsoft’s upcoming powerhouse. The most important changes include 4K and HDR support on the One X, but the title will also run and look better on 1080p screens thanks to supersampled antialiasing. “With 4K, you get so much more visual feedback that can actually help you improve as a player – you’ll be able to more easily discern an army composition at a glance with the increased visual fidelity, which is critical for coming up with counter strategies, recognizing key threats and more”, Stone told Xbox Wire. Halo Wars 2 is available now for Xbox One and PC. The Xbox One X update weighs in at 47.51GB.